One of the most popular RV refrigerators is the Norcold model, made by the Thetford Corp. This refrigerator uses either propane gas or electricity for power. For optimal operating function, Thetford advises running the Norcold refrigerator on AC power when you are camped at altitudes above 5,500 feet. If the refrigerator is operated on liquid propane at higher altitudes, burner outages may occur. Ensure that your RV is parked within a 3-inch off-level side-to-side angle or a 6-inch off-level front-to-back angle. 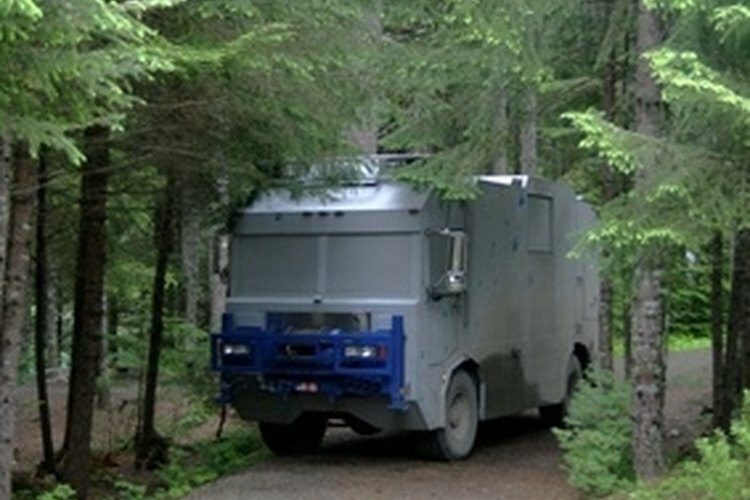 Move the RV to a more level position for optimal operation. All RVs refrigerators must be nearly completely level to properly operate. Load food only when your refrigerator reaches optimum chilling temperature. Do this by turning on power at least one day before hitting the road, since your Norcold refrigerator must be on for at least eight hours before packing with food. Close the refrigerator completely by listening for a clicking sound when shutting the door. Once the refrigerator has reached an ideal temperature, pack it with food while ensuring that air can circulate between items. You can create more airflow space by moving or eliminating groceries. Read and understand the fault codes that appear on your Norcold refrigerator's exterior readout panel. If you are using liquid propane for power, an error fault code of "F" means that your refrigerator won't light. If this occurs, consider the altitude of your campsite. At elevations higher than 5,500 feet, keep a butane lighter nearby and prepare to manually relight the refrigerator frequently. Colder temperatures will exacerbate the situation. Expel the air from your propane gas supply lines. Anytime you refill and replace propane cylinders, air may become trapped in the gas lines, which may cause outages and reduced power. Purging air is easy, simply push and hold the Norcold's on/off button to turn it off, then on again. Repeat it a few more times until all fault codes are cleared and the refrigerator ignites. Test the electricity leads going into the refrigerator control panel with a multimeter voltage reader tool. This will rule out any low voltage issues, which decrease performance. The AC voltage of a Norcold refrigerator should be in between 108 and 132 volts and between 10.5 and 15.4 volts for CV voltage. Ensure your RV batteries are charged with your multimeter voltage reader. RV refrigerators need at least 12 volts of battery power to ignite. Check that a ground line connection exists between your refrigerator and the chassis, and also confirm that the refrigerator is connected to the ground wire. Use tension bars on the inside of the refrigerator to prevent items from pressing against the door panel, which can lead to door handle spring failure. Be aware that barbecue lighters brought up from sea level may not work at altitude. It's best to purchase one at the altitude closest to where you will be camped. Avoid testing AC power with your multimeter voltage reader set to DC power. This may cause a short circuit in the electrical system and damage the multimeter. How do I Light a Norcold Gas & Electric Refrigerator?